Mind have been worki ng together with the McPin Foundation since 2014 to evaluate the experience of people using our federated local Minds through the annual ‘Your Experience in Mind’ survey. We have 146 local Minds across England and Wales providing over 50 different types of service. It is important that these services are shaped by those people who use them to enable us to improve the support we provide. The survey aims to explore the extent to which local Mind services promote recovery, offer a person-centred experience which adapts to people’s individual needs and preferences, and are culturally appropriate and accessible for people from a diverse range of communities. Additionally, we wanted to investigate how peoples’ experience of local Mind services differ to that of other mental health services. Collecting information from across a large network is never easy. We originally commissioned a project team to assess how best to capture feedback and they began the process of developing a survey called ‘Your Experience in Mind’. McPin developed this survey further and it has enabled us to engage with thousands of people across the country in a relatively short period of time. In 2015 twenty local Minds took part in the survey. Within these local Minds, twenty five people with lived experience of mental health problems worked as survey champions promoting the survey in their local area, helping fellow members to complete the survey online or on paper, and providing feedback on the final evaluation report. Both Mind and McPin believe that involving people with lived experience in all stages of research, from initial design to reporting, is an empowering experience that contributes to mental health recovery. It also improves the quality of data collected, and the insights available to the research team. All of the local Mind survey champions attended training with McPin to prepare them for the role, and were supervised by two McPin peer researchers. I attended one of the training sessions and was really pleased to see how enthused the champions were to be part of the project, and how many ideas they had to encourage fellow service users to complete the survey. A major advantage of working with the survey champions on this project is their knowledge of their local area and how their individual local Mind works, which meant they were able to successfully engage with a large number of people. Overall we received 1,449 completed surveys from a diverse range of people using Local Mind services, with an average response rate of 75 surveys per local Mind; an increase on the previous year. The majority of people were happy with the type of services provided and the quality of support they received. Eighty Five per cent said they would recommend their local Mind to family and friends. Many people also made positive comparisons to other services that they had accessed. Each local Mind that took part in the survey received a tailored individual summary of the findings for their area, as well as an overall summary report. We received very positive feedback on these reports from the local Minds. Many found it useful and informative to get user feedback about their services, and felt it provided a good opportunity for people to suggest improvements to existing services and ideas for new services. Additionally, some local Minds told us they will use their individual reports to help re-design their services, review their engagement models, and to support upcoming funding applications. The survey report has been included as part of the annual report for the local Mind network, has contributed towards our end of strategy performance reporting for 2012-2016, and has helped to inform planning for the local Mind network for the next strategic period. 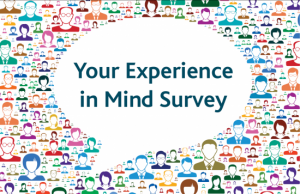 The positive experience of this year’s survey champions will be used to inform Mind’s future work with peer researchers, and the findings from the report will also help to develop next years’ local Mind service feedback survey. The Mind Research and Evaluation Team would like to thank the team at McPin and all of the survey champions for all their hard work on this project. We know that McPin have interviewed some of the survey champions about their experiences of working with us, and are looking forward to reading about that soon.